Craniopharyngiomas are benign tumors that occur at the base of the brain, above the pituitary gland. Craniopharyngiomas occur both in children and adults. 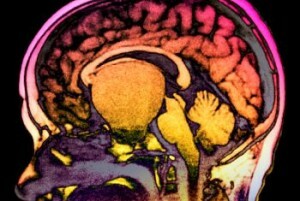 They are relatively rare, comprising 2 percent to 4 percent of primary brain tumors. Craniopharyngiomas can grow to large sizes (bigger than a golf ball) without causing symptoms. Under the microscope, some craniopharyngiomas cells look very similar to cells that produce tooth enamel. 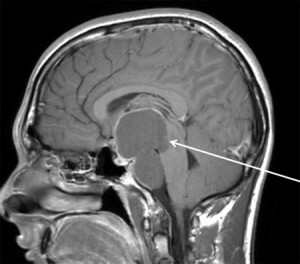 Symptoms produced by a craniopharyngioma vary depending upon the tumor’s location. If the tumor involves the optic tracts, chiasm, or nerves, blindness can occur. 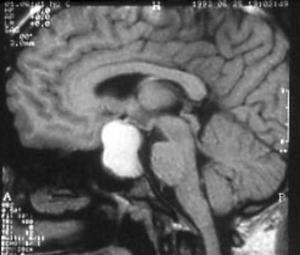 Involvement of the hypothalamus, an area at the base of the brain, may result in obesity, increased drowsiness, temperature regulation abnormalities, and diabetes insipidus (excessive thirst and urination). Other common symptoms include personality changes, headache, confusion and vomiting. The diagnosis of a craniopharyngioma is made primarily based on brain imaging, but other testing is essential. A high-resolution MRI scan is very valuable because it allows the neuroradiologist to view the tumor from different angles. A CT scan (computed tomography) is important because it can detect calcification in the tumor. Compression of the optic nerves and chiasm (crossing point of the optic nerves) can cause severe visual loss. 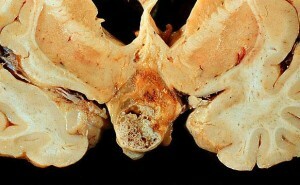 Craniopharyngiomas have traditionally been removed by a cranitomy approach. Endoscopic approaches are relatively new and require specialized training and experience. This technique uses the natural nasal passageway and therefore does not require a head incision. We are experts in advanced endoscopic techniques. These techniques are generally can be equally effective in removing all the tumor, while at the same time minimizing hospitalization time, and discomfort. 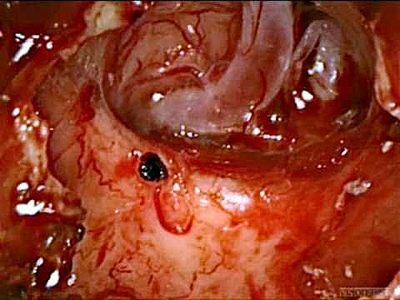 Not every craniopharyngioma tumor can be removed using an endonasal endoscopic approach. A craniotomy requires a scalp incision, and the temporary removal of a piece of skull. A surgical microscope is used the provide high magnification so that the neurosurgeon can safely gain access to the tumor. The most commonly used approaches involve gently elevating the base of the frontal lobe of the brain, above the eye. We are experts in skull base approaches that minimize the amount of brain retraction. The incision is placed so that, in general, it is not visible after the wound heals. In some cases, a craniotomy is the preferred approach. We are experts in both craniotomy and endoscopic techniques, and are available for primary consultation or second opinions. Stereotactic radiotherapy is a technique in which a high dose of radiation can be delivered to the tumor target. Remarkably, the surrounding brain structures receive only a fraction of the radiation dose and are typically unharmed (with the exception of the normal pituitary gland). We use advanced Novalis TruBeam radiation delivery system, which allows treatment of irregularly shaped tumors that are close to critical brain structures. One of the main drawbacks of radiation treatment is that it leads to delayed pituitary failure. This typically occurs several years after treatment, necessitating complete hormone replacement. Radiation therapy is typically used for tumors that cannot be cured surgically. Problems with hypothalamic function can be particularly challenging to treat.